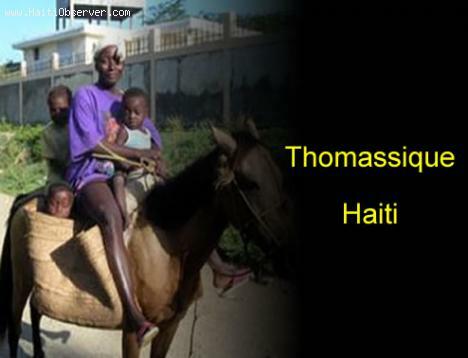 Thomassique is a city-ship of the Cerca la Source Arrondissement, part of Centre Division of Haiti. As a rural area with a population of 42,557, its resources are challenged, especially with regard to clean drinking water. Since the 2010 earthquake toppled the infrastructure of Haiti, lack of purified drinking water has been a pressing issue. Dust, debris, and sewage from the fallout of the quake entered the water systems over much of the country, causing high rates of cholera among populations. Symptoms of cholera: dehydration, diarrhea, vomiting, and cramping, if not treated quickly, can lead to coma and death. Thomassique has two water sources to draw from: a river nearby and water pumped through a delivery system from Cerca la Source. The water is impure and contains poisonous levels of cholera bacteria. Many non-government organizations have flocked to Haiti to help rebuild the country's infrastructure. One of these, a group of Duke University students, is working on a project to instruct the townspeople on safe water practices. The students have seen first-hand the heart-breaking living conditions of Thomassique: flimsy wood huts and public spaces with only timber stanchions and corrugated tin roofs to protect them from the blistering sun. The goal of the project is to raise the standards of water sanitation and its impact on the incidence of cholera cases, to meet the World Health Organization's WASH requirements. In response, the students are conducting information sessions on clean drinking water; appropriate hygiene and sanitation practices; and how to disinfect drinking water through solar disinfection in Thomassique.